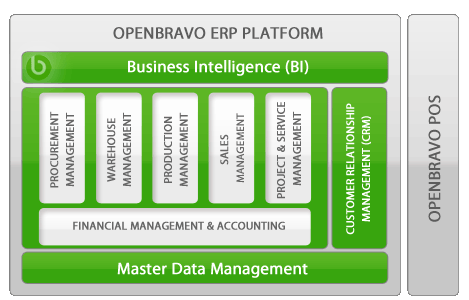 Openbravo ERP has been designed with broad business functionality to help businesses improve overall performance. It is based on a single, integrated database model covering all key application areas of a complete business management system, including seamless integration to Business Intelligence (BI) and Point of Sale (POS). Configurable language for each user. Keyboard navigation for faster operation. Possibility to attach documents, images or files to any register in the application. Configurable filters and flexible record sorting. Embedded selectors in the forms for the most used entities (products, business partners, accounts, projects, orders, invoices...). Configurable batch processes of tasks that can be scheduled on specific times. Access levels defined per user based on roles. Support for secure connection over https. upport for CAS based single sign on. Pre-integrated with Openbravo POS and Pentaho BI suite.